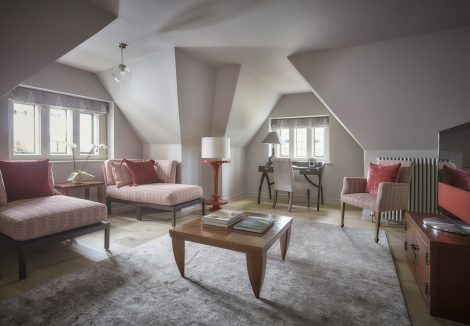 Our suites are individually designed to provide elegant and stylish accommodation. Luxurious, spacious and therefore perfect for an indulgent weekend or spa break. Whatley Manor is one of the Cotswolds luxury hotels and we are proud to present a selection of exceptional suites. Lots of indulgent treats are also waiting in your suite for you. Homemade biscuits & elderflower cordial, still and sparkling mineral water, Whatley Manor chocolate bar, coffee and tea making facilities. Every suite benefits from efficient WiFi and our chrome cast TV’s allow you to stream directly from your own devices. Our ground floor suite looks out to the north garden and is also dog friendly. Two of our suites offer a sofa bed for family accommodation.